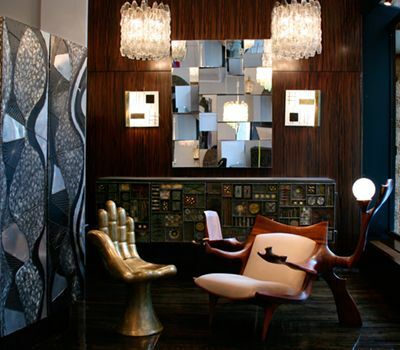 Todd Merrill buys premium designer name furniture from the 1920s through the 1980s. Some makers that we are interested in include: Karl Springer, James Mont, Tommi Parzinger, Paul Lazslo, Paul Evans, Philip and Kelvin LaVerne, Samuel Marx, Arthur Elrod, Harvey Probber, T.H. Robsjohn-Gibbings, Vladimir Kagan, Phillip Lloyd Powell, Jack Rogers Hopkins, Michael Coffey, Edward Wormley, Dunbar, George Nakashima, Wharton Esherick, JB Blunk, Charles Hollis Jones, Monteverdi Young, Widdecomb, Grossfeld House, Osvaldo Borsani, Ico Parisi, Gio Ponti, Aldo Tura, Venini, Vistosi, Barovier, Murano, Fontana Arte, Maison Jansen, Jacques Adnet, Ado Chale, Gabriella Crespi and Willy Daro to list a few. If you have designer name furniture that you are looking to sell please send us an email with detailed photographs, a description of the pieces, elaboration of any condition issues, and provenance.